Paths of Glory (1957) is a masterful, unsentimental, classic anti-war film about World War I. It was 28 year-old Stanley Kubrick's fourth feature-length film (Kubrick served as its director and co-writer with Calder Willingham (screenwriter for Little Big Man (1970)) and blacklisted crime novelist Jim Thompson), but it was his first major success, following after his first amateurish feature Fear and Desire (1953) (subsequently removed from circulation and screenings by Kubrick himself), Killer's Kiss (1955), and MGM's low budget The Killing (1956). [Note: Kubrick's work with actor Kirk Douglas in this film led to his choice as a replacement director for Anthony Mann for Spartacus (1960), following a falling out between Douglas and Mann.] Kubrick's film was added to the Library of Congress National Film Registry in 1992. Juxtaposed in interesting fashion, this low-budget, independent production with a distinctly European flavor premiered one week after the release of David Lean's Best Picture-winning, CinemaScopic war epic blockbuster, The Bridge on the River Kwai (1957) from Columbia Pictures. This stark, slightly stagey, 87-minute black and white film, shot on location in Germany with crisp B/W photography (by George Krause) with a budget less than $1 million, is as compelling and harsh an indictment and criticism of war as Lewis Milestone's award-winning, anti-war classic All Quiet On The Western Front (1930), adapted from Erich Maria Remarque's novel. Although the film is considered one of Kubrick's best, it was denied even a single Academy Award nomination. The suicidal attack on an impregnable fortress named 'Ant Hill' in the film (against an unseen German enemy) was inspired by and loosely based upon the six-month bloodbath in 1916 during the Battle of Verdun for Fort Douamont, a French stronghold eventually captured by the Germans. (The same battle was frequently referred to in Renoir's The Grand Illusion (1937)). The protracted conflict claimed the lives of 315,000 French soldiers (called poilus) on the Western front. Due to the film's raw, controversially-offensive and critical assessment of hypocritical French military and bureaucratic authorities who callously condemn and sacrifice three randomly-chosen innocent men with execution (for cowardice) for their own fatal blunder, it suffered poor box-office returns, and was banned in France and Switzerland for almost twenty years (until the mid-1970s) following its release. "IT EXPLODES IN THE NO-MAN'S LAND NO PICTURE EVER DARED CROSS BEFORE!" 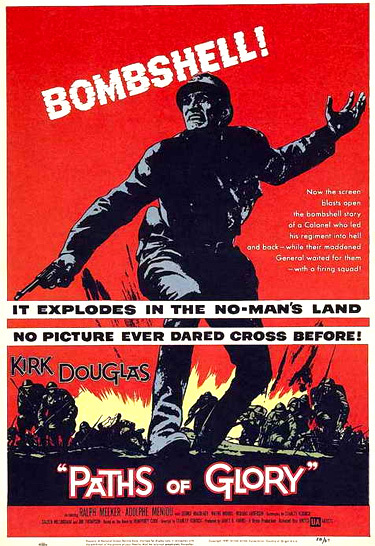 It also describes the film thusly: "Now the screen blasts open the bombshell story of a Colonel who led his regiment into hell and back - while their maddened General waited for them - with a firing squad." Based upon the controversial, published, semi-fictional 1935 novel of the same name by Humphrey Cobb, this anti-war film emphasizes the wide, hierarchical gap between those who take orders and fight the wars in muddy trenches, and those that give the orders and are isolated from the real ravages of war. Three blameless, subordinate soldiers are victimized, given hopeless 'paths of glory,' and condemned to die to cover up the wrong-headed actions of their ruthless and opportunistic superiors. Kubrick also commented upon the subject of war and conflict in two other films: his epic costume drama Barry Lyndon (1975) (the Seven Years' War), and in the historical epic film Spartacus (1960) (the slave uprising). War began between Germany and France on August 3, 1914. Five weeks later, the German army had smashed its way to within 18 miles of Paris. There the battered French miraculously rallied their forces at the Marne River, and in a series of unexpected counterattacks, drove the Germans back. The Front was stabilized and shortly afterward developed into a continuous line of heavily fortified trenches zigzagging their way five hundred miles from the English Channel to the Swiss frontier. By 1916, after two grisly years of trench warfare, the battle lines had changed very little. Successful attacks were measured in hundreds of yards - and paid for in lives by hundreds of thousands. A grand, stately, palatial chateau [Schleissheim Castle], seen from its exterior, has been commandered by the French as their attack command center and field headquarters - French army officers live there in elegant luxury. Two of the film's main characters are introduced. Corps Commander General George Broulard (Adolphe Menjou), a wily, cultivated but calloused, evil, scheming and ruthless officer in the French High Command arrives in an open car, to discuss top-secret military maneuvers with his vainglorious subordinate - the scar-faced divisional General Paul Mireau (George Macready, with a real facial scar - the result of a serious car accident). It's out of the question, George. Absolutely out of the question. My division was cut to pieces. What's left of it is in no position to even hold the Ant Hill, let alone take it. I'm sorry, but that's the truth. Manipulatively with subtle and persuasive urgings as they weave around each other in the large room, Broulard intimates that the vain-glorious, ambitious Mireau might be considered, as a "fighting general," for a rapid promotion to the Twelfth Corps (with another star) if the Ant Hill is taken. Mireau first expresses his concern and attitude toward his troops - with some lack of conviction. Mireau: I am responsible for the lives of 8,000 men. What is my ambition against that? What is my reputation in comparison to that? My men come first of all, George. And those men know it, too. Broulard: I know that they do. Mireau: You see, George, those men know that I would never let them down. Broulard: (unimpressed, with a glib reply) That goes without saying. Mireau: The life of one of those soldiers means more to me than all the stars and decorations and honors in France. Nothing is beyond those men once their fighting spirit is aroused...We might just do it! Hello there soldier, ready to kill more Germans? (1) Private Ferol (Timothy Carey) is asked: "Are you married, Private?" The Private responds: "No, sir." Mireau continues: "... Well, I'll bet your mother's proud of you!" (2) Corporal Paris (Ralph Meeker) is asked: "Looking over your rifle, I see? Well, that's the way. It's a soldier's best friend. You be good to it and it will always be good to you." (3) Private Arnaud (Joseph Turkel), a third soldier, is also encountered. Sergeant, I want you to arrange for the immediate transfer of this baby out of my regiment. I won't have any of our brave men contaminated by him. Mireau: I never got the habit of sitting. I like to be on my feet. Keep on the move...I can't understand these arm-chair officers, fellas trying to fight a war from behind a desk, waving papers at the enemy, worrying about whether a mouse is gonna run up their pants leg. Dax (sarcastically but sensibly): I don't know, General. If I had the choice between mice and Mausers, I think I'd take the mice every time. When they study the Ant Hill with binoculars amidst explosions and the whine of shells, Mireau expresses his plan in a veiled way: "It's not something we can grab and run away with, but it certainly is pregnable." Using the same manipulative methods that were used by Broulard on him, to convince him to cooperate, Mireau compliments Dax on his success as a criminal lawyer in his former civilian life. And then he jitteringly reveals the plan for the next day - Dax's regiment is to take the Ant Hill. Mireau is unruffled and casually calculates that over half of the men will be casualties in the assault on the hill, but they can still hold the position with the survivors. Naturally, men are gonna have to be killed, possibly a lot of them. They'll absorb bullets and shrapnel, and by doing so make it possible for others to get through...say five percent killed by our own barrage - that's a very generous allowance. Ten percent more again in no man's land, and twenty percent more again into the wire. That leaves sixty-five percent, and the worst part of the job over. Let's say another twenty-five percent in actually taking the Ant Hill - we're still left with a force more than adequate to hold it. Panicked and somewhat short of breath, Mireau also appeals to Dax's patriotism and the name of France, but Dax is stunned, knowing that the scheme is impossible and suicidal. He quotes Samuel Johnson's words: "Patriotism...is the last refuge of a scoundrel." Mireau threatens that Dax will be relieved of his command if he doesn't agree to the attack. Although he is tired, Dax concedes to the plan to stay close to his men and to follow military orders: "If any soldiers in the world can take it, we'll take the Ant Hill." Although he is an officer, Dax must still personally lead his men, suffering along with them. Mireau promises a reward to placate him: "And when you do, your men will be relieved and get a long rest." Three officers, cowardly Lieutenant Roget (Wayne Morris), Corporal Paris and Private Lejeune (Ken Dibbs) are ordered by Dax (and wished good luck) to go on a reconnaissance patrol into the darkness of no-man's-land before the assault. The lieutenant has "fortified" himself with drink to bolster his courage. Flares are to be sent up at five-minute intervals to guide them. Crawling in the dark through the scarred land full of shell holes, twisted barbed wire, watery pits and rubble, the Lieutenant sends the private out ahead as an advance scout, although Paris thinks it is unwise to split a night patrol. Terrified, Roget panics after an unexpected delay, thinking they should return to their own lines and forget about Lejeune. Two flares light up the ghastly no-man's land scene. When Roget sees a figure move, he thoughtlessly hurls a hand grenade into the darkness and then runs back to the French lines. When he investigates, Corporal Paris finds Lejeune's ripped-open body. Roget: I thought you'd been killed. Paris: You didn't wait around to find out, did you Lieutenant? Roget: Now look here, what do you mean? Paris: I mean you ran like a rabbit after you killed Lejeune. Roget: Killed Lejeune? What are you talking about? (He rises) I don't think I like your tone. You're speaking to an officer, remember that. Paris: Oh, well, I must be mistaken then, sir. An officer wouldn't do that. A man wouldn't do it. Only a thing would - a sneaky, booze-guzzling, yellow-bellied rat with a bottle for a brain and a streak of spit where his spine ought to be. You've got yourself into a mess, Lieutenant. Have you ever tried to bring charges against an officer? It's my word against yours, you know, and whose word do you think they're gonna believe - or, let me put it another way, whose word do you think they're going to accept? In his report, Roget hides his responsibility for Lejeune's death by writing that the private was killed by machine gun fire when he coughed. Preparing for the assault on Ant Hill, just before dawn, Dax speaks to his officers in his bunker. Artillery will start at "zero five-fifteen," and the last wave out should be no later than "zero five-forty." There will only be minimal artillery support so as not to alert the enemy to a full-scale advance. Dax wishes all of his officers good luck and expresses his confidence in them. Two privates in their quarters talk about their chances of survival and fears, more afraid of getting hurt by high explosives or bayonets than dying. General Mireau waits in his command post, offering a toast of cognac "To France" before the assault. At dawn, Dax strides solemnly through the center of the trenches with bombs blasting on every side, inspecting and reassuring his men as they make room for him to pass through the narrow corridor - the lengthy one-take shot is about 65 seconds long. They are ready with fixed bayonets to go over the top for the assault. Memorably filmed like a documentary (without a sweeping musical score), the lengthy and fluid tracking shots follow him from behind, then from in front, as the bombardment increases - the air is full of mortar explosions, the sound of machine guns and rifle fire, and the whine of bombs. The build-up of tension is terrific. Parts of the reinforced walls of the trench slide and crumble, and the end of the trench is concealed by a shroud of dust and smoke. Dax climbs a ladder, crouches, ready with a pistol in one hand. After a countdown on his watch, he blows a whistle to signal his men to charge over the top of the trenches toward the Ant Hill.